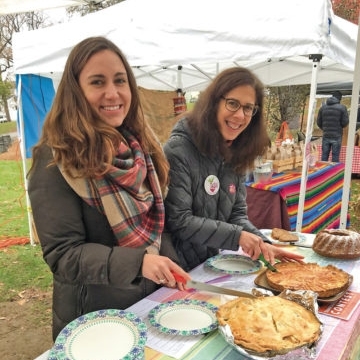 Westchester Magazine names the TaSH to its 2017 "Best of Westchester" list for "Best Revamped Farmers Market"
…And, while we are on the sub­ject of pies, don’t for­get to en­ter TaSH’s Thanks­giv­ing Dessert Con­test (not just pies!) on Clos­ing Day, No­vem­ber 17th by mak­ing your best Thanks­giv­ing dessert us­ing your fa­vorite farmer’s mar­ket sea­sonal in­gre­di­ents. Treat your taste buds to an international vacation with foods such as Russian pickles and radicchio marmalade. The Tarrytown and Sleepy Hollow (TaSH) Farmers Market, a DVlicious 2016 winner for "Best Farmers Market," was named to Westchester Magazine’s “Best of Westchester” list for 2017. “What’s in season?” may be the most-asked question at the farmers market, but this year that simple query has lofty aims at the Tarrytown and Sleepy Hollow Farmers Market. "Farmers Markets Open Outdoors Earlier in the Season"
"Purple crocus may be timidly poking their heads above soil, but the bright white tents of outdoor farmers markets are already on full display in some areas of the Hudson Valley. This year, farmers markets in Westchester and Rockland are popping outside earlier than ever — April showers and lingering low temps, be darned. (See list of 30+ farmers markets below)..."
"5 things to eat in August"
"Deb Taft, who owns Mobius Farm in Katonah, sells gorgeous varieties, including Flying Saucer, Y Star, Sunburst and Bennings Green Tint. She loves "grilling or roasting whole, especially with while grilled or roasted cipollini onions which, conveniently, I also have!" she says. "The texture is so fine and creamy that any treatment is going to yield something yummy. A simple sauté of chunks — again, with cipollinis — is fantastic." Mobius Fields is at the TaSH (Tarrytown-Sleepy Hollow) market..."
"Tarrytown-Sleepy Hollow Farmers Market Is DVlicious Winner"
"Part of what makes TaSH special -- aside from its array of rotating vendors, live music and special events -- is the passion behind the community that rallied to make it a reality." "The Tarrytown and Sleepy Hollow Farmers Market will open for its second season with more vendors, expanded educational activities, and improved access for low-income shoppers on May 28." "Topics discussed included weather and soil conditions, shoppers’ willingness to expand purchase preferences, sustainability practices and myriad factors that impact how farmers price their food." "Community organizations such as Open Door Family Medical Centers, Family Services of Westchester and the Community Food Pantry of Sleepy Hollow and Tarrytown are helping the TaSH inform shoppers who use WIC and SNAP benefits that they can use them at the market." "Festival tents pop open and vendor tables unfurl seemingly out of nowhere every Saturday within Patriots Park, a four-acre swath of green with monuments, a playground, a stream running through it, a high school across the street, and a library within shouting distance. This patch of verdant land straddles the border of Tarrytown and Sleepy Hollow, two tight-knit communities that share a zip code"